Home » News » Chinese Fun At The Fed! Chinese Fun At The Fed! The Fed’s mental health support group, the Drop-In, recently took a whirlwind trip to China – all without leaving their regular meeting place at The Purple Room Community Centre at Heathlands Village! 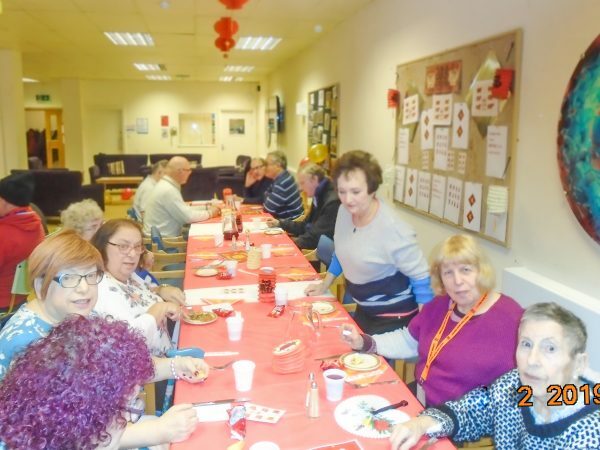 To celebrate Chinese New Year – 2019 being the year of the pig – 16 Drop-In clients were treated to a Chinese-themed party, with music, entertainment and a delicious kosher meal. “Chinese New Year represents good luck and general prosperity, which was a wonderful opportunity to put on a social evening for our Drop-In group.” said Sara Ogden-Thompson, Manager of our Community Advice and Support Team. Kung Hei Fat Choi – or as we might say, Happy New Year!